Impact wrench arrived as emailed and in perfect condition. Charged both batteries - then put to test removing all wheel lug bolts from a large 5th wheel trailer to service bearings and retorque all suspension components. Milwaukee High Torgue removes lug bolts like butter. Really like the auto rpm reduction after busting lug nuts loose so the lug nuts do not fly out of the socket. So far So good ... all I can say is this Impact Wrench is a real work horse. Well built high quality. Only semi disappointment is the charger - you have to fiddle around when inserting batteries to get the red charging light to illuminate indicating it’s being charged - even when carefully inserting batteries into charger you either get no charging lamp illumination or flashes red & green alternately - remove battery and reinsert like 4x then proceeds with normal charging indicator. Too much fiddling around for my liking. On the plus side the entire impact kit is nicely in a Milwaukee Hard Case instead of the canvas bag. This gun is very powerful. I have used it on the rear suspension of a 1971 Chevy that was sitting for 30 years in the rust belt. It has taken out almost all the bolt that I have asked it to do. This is a very good kit to build an M18 line out of with the 2 5 amp hour batteries and the charger there is just about nothing that you can't do. The only bad part about this gun is the weight, it is very heavy. I broke down and bought this one because it was on sale. I have the mid torque one which I think is amazing on lug nuts (love the 100 ft.lb. setting) but lacks power for some of the bigger fasteners I have to work with. My only negative about it is that it's relatively heavy for all day use. What are the technical differences vs model 2763 other than torque (anvil different, length, weight, etc)? What is the difference in power between 2863-20 an 2767-22? How many batteries are included in this kit? This kit comes with 2 batteries. Where do I find battery? BEST ANSWER: We do not stock model 6546-1, if the item is a M18 item any M18 battery will work with the tool. The same thing will apply for the M12 items. 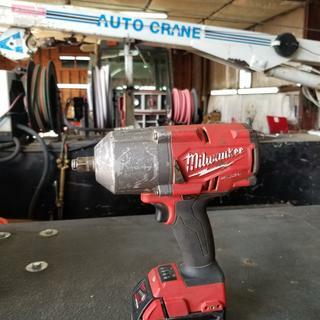 You can contact Milwaukee directly at 1-800-729-3878. The agent will be able to better assist you with the item. The battery included in this kit is the 9.0? BEST ANSWER: No, the battery included in this kit is 5.0 Ah. Does this come with 4.0 Ah batteries or 5.0? BEST ANSWER: Yes, the charger is included. BEST ANSWER: Please contact Milwaukee direct @ 1-800-729-3878 for assistance with parts and accessories.